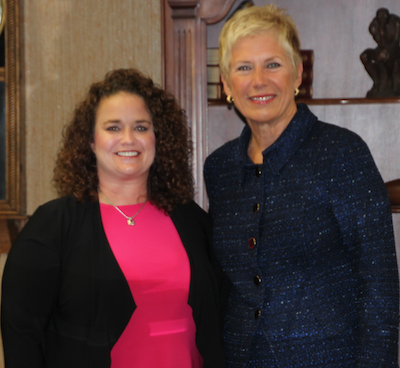 Alyson Glass, the winner of the 2013 Bob Costas Grant for the Teaching of Writing was recognized by State Superintendent Janet Barresi and the State Board of Education during the board's meeting on Tuesday. Glass is an English language arts teacher at Geronimo High School. Glass says that with the grant funds she will be able to introduce her 8th- through 12th-grade students to the world of professional writing. She intends to involve her students in activities such as workshops and the initiation of a creative writing club that will publish a literary magazine. She also has plans to start an Advanced Placement writing program for the students at her school. "I am thrilled to be able to recognize Ms. Glass for this award," State Superintendent Janet Barresi said. "Being able to write well is a skill of utmost importance. Developing this communication tool in our students and pursuing the rigor of an AP writing program is admirable."